Everybody’s talking about this new drug called Sleep. Apparently it works miracles. The self-help headlines scream at me as if it’s a choice: GET MORE SLEEP! Get more sleep? Sure. And I’ll just grow another arm while I’m at it. I’m writing this post at 3:44 a.m. because, according to the “sleep specialists” I’ve seen, my body clock thinks 3:44 a.m. is a proper time to be awake and writing a post. “Your body wants the day to last longer than the normal 16 hrs,” one of the specialists told me. He then told me what I could do about this problem, which was absolutely nothing. Great insight, doc. I’ll write you a thank you note at 3:44 a.m.
Ambien: too strong—wake up not knowing where (or who) I am. Melatonin: too weak—wake up all night because it doesn’t work. Unisom: too groggy—wake up feeling like a hungover druggie. Which, if you think about it, is exactly what I am. 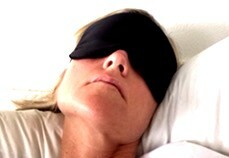 And yes, people: I’ve even worn the Sleep Mask. Glamorous it is. Works it does not. Re-vamp my wardrobe (Modern Chic meets Cali Boho.) Wait, that’s my home decor. Whatev–Pinterest is all the same at 4 a.m.
It’s a long and impressive list, I know. But what my insomnia doesn’t allow me is to improve my mood, alertness, weight control, parenting, spiritual whatevertheheck it was and don’t even get me started on my toll painting skills. I’m not functioning at my best, I’m told, because I’m not getting enough sleep. The solution, I’m told, is to get more sleep.